An Achilles Tendon Rupture How Do I Know I Suffered One? The Achilles tendon is a conjoined tendon composed of the gastrocnemius and soleus muscles with occasional contribution from the plantaris muscle, and it inserts on the calcaneal tuberosity. The plantaris muscle is absent in 6% to 8% of individuals. 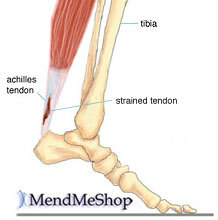 The Achilles tendon is approximately 15-cm long and is the largest and strongest tendon in the human body. The tendon spirals approximately 90? from its origin to its insertion and this twisting produces an area of stress approximately 2- to 5-cm proximal to its insertion. The tendon has no true synovial sheath; instead it is wrapped in a paratenon. The Achilles tendon experiences the highest loads of any tendon in the body, and bears tensile loads up to 10 times body weight during athletic activities. The tendon most commonly ruptures in a region 2- to 6-cm proximal to its insertion.